Can current console hardware handle an increasingly more advanced game engine without compromising COD's unique gameplay experience? Another year, another Call of Duty - and, from a technological perspective, Black Ops 2 could prove to be the most ambitious yet. Treyarch's latest continues the company's tradition of expanding and improving upon the core Infinity Ward engine, with a host of new engine advancements revealed in the footage seen to date. The question is, at a time where many developers seem to be approaching the limits of current-gen consoles, can this ever-evolving codebase sustain the 60 frames per second update that the series has always aspired to? The best way to evaluate what we've seen of the game thus far is to take a look at the extended gameplay demo we saw at the E3 press conference. First impressions are positive - Black Ops 2 appears to be building upon the impressive character-rendering and animation tech pioneered in Treyarch's last game, and it's clear that the firm considers this a major element in its storytelling arsenal, as it's showcased extensively in the reveal trailer too (a 60FPS encode of which you'll find at the foot of this article). As the gameplay demo continues, it's immediately apparent that the developer has also made some major strides in size and scale - environments are immense, rich in detail - not just in terms of basic layout but also in the amount of animated incidental action. It's also believed that there will be multiple branches through each level as well, boosting the replay factor, and certainly giving the background streaming tech a more robust workout. Also impressive are improvements to general effects work. Treyarch doesn't hold back on performance-sapping transparent alpha effects, with a real sense of volume to the effect, helped still further by a rich level of debris in high-impact explosions. Destruction - in the form of scripted sequences (such as the collapse of an elevated freeway in the demo) - also looks a class apart too. Realistic physics at high frame-rates simply look sensational, and whether it's collapsing scenery or downed jet-fighters, it's clear that Treyarch is really pushing the boat out with the COD campaign's signature set-pieces. In addition to these enhancements, the development team has also made some fundamental changes to the core rendering tech. Lighting has been significantly improved through the implementation of high-dynamic range rendering - in Modern Warfare 2 especially, the game was prone to both white and black crush, where detail is lost at the extremes of the lighting scale. In the reveal trailer specifically, the fundamental improvements here are plain to see. Based on analysis of trailer footage (which seems to be from Xbox 360), the series' 1024x600 native resolution also sees a slight bump too - in one axis at least - now rendering at 880x720 with 2x multi-sampling anti-aliasing (MSAA). The "locked 60FPS" phrase has been synonymous with the Call of Duty series since the arrival of Modern Warfare back in 2007, but the reality is somewhat different - Infinity Ward and Treyarch have always compromised to a certain extent between graphical features and performance. These links will take you to head-to-head Xbox 360 vs. PlayStation 3 comparison analyses for every major cross-platform COD title released this generation. In its marketing to date, Treyarch also talks about "bounce lighting" and ambient occlusion as new additions to the Infinity Ward engine. Based on what we've seen thus far, these appear to be "baked" into the levels (pre-rendered in other words) and the AO in particular is not present where we would expect to see it as a real-time screen-space effect - on downed opponents for example. We'll need to get a closer look at the game to see a better view of other new additions to the engine; intersecting shadows, self-shadows and "reveal mapping" (some kind of texture-blending technology we're not entirely clear on) have also been added to the mix. Modern Warfare 3 had some pretty large, rich environments, but watching the complete E3 gameplay demo, Black Ops 2 looks like a step beyond this, particularly when the additional effects work and lighting are factored in. So just how can Treyarch run this game at 60FPS? Let's have a quick look at how Black Ops 2 stacked up as it was presented at E3. Analysis proved to be an interesting challenge bearing in mind the lack of 60Hz direct-feed video available - internet video generally tops out at 30 frames per second, meaning we're only seeing half of the video output from the console. This is fine for most games, but clearly not ideal for Call of Duty titles. Thankfully Spike TV's coverage of E3 gives full temporal resolution once the 1080i transmission stream has been converted back into the game's native 720p format. While overall picture quality isn't exactly brilliant, the fact is that broadcast transmission is the only way to accurately represent the flow of a game - the only way to get at the 60 frames per second we need. However, the lossy compression poses some serious challenges - the threshold of what constitutes a duplicate/dropped frame is much higher than a pure HDMI feed and, what's more, it changes from moment to moment. We ran high-action clips through our tools, manually checking hundreds of borderline frames, correcting them where appropriate. While human error may crop in, the overall flow of the edit should be representative of the demo's performance as it was seen at E3. The Spike scrolling text at the bottom was cropped out for the purpose of the analysis, but it proved to be useful in ascertaining that the transmission feed itself was fine: the text continued to scroll while the game produced a duplicate frame. Treyarch's intent seems to have been to target something approaching the visual richness we see in top-tier 30 frames per second shooters while retaining Call of Duty's trademark 60Hz update. While the overall sophistication of aspects such as physics, particle effects, texture quality and lighting might not be quite up to the standards of Battlefield 3, the overall level of presentation we see just from this slice of Black Ops 2 gameplay is impressive. Unfortunately, in common with the original Black Ops there is a clear hit to frame-rate and perhaps a sense of over-ambition in the design that is actively impeding performance. The initial scene in the video above is perhaps a good case in point: Treyarch's characters are superbly detailed with excellent animation, but running several of them simultaneously in addition to the load of the outside environments seems to cause a tangible impact to frame-rate. Additionally, when the pyrotechnics kick off (both in the car and in the turret in the second clip), the effects work here causes a considerable drag. Taking a hit on frame-rate in favour of visually richer cut-scenes isn't much of a big deal: virtually all of the COD games do it to varying degrees, and the game's handshake with the player isn't in danger of being compromised in a non-interactive scene. Similarly, when huge, screen-filling explosions are kicking off, it doesn't feel so wrong that control lags a little. However, the analysis shows that frame-rate dips significantly from 60FPS even during gunplay, and that's a point of concern. "Assuming the reveal trailer is taken from the console version, there's evidence to suggest that Treyarch has adjusted resolution to 880x720 compared to the traditional 1024x600 seen in previous COD titles." The Black Ops 2 reveal trailer seems to be running from Xbox 360 code, and taking a look at some hard edges suggests that native rendering resolution has been adjusted from the 1024x600 of previous CODs to 880x720 with 2x MSAA. These shots demonstrate that the upscaling technique used has been significantly improved, looking cleaner with reduced blur. 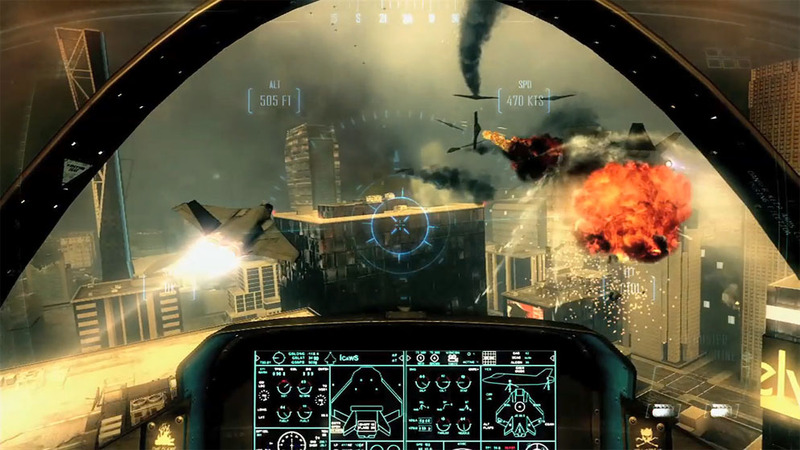 In the past we've referred to the COD games as possessing a "perceptual 60FPS" - that is, a performance profile that generally stays north of 50 frames per second to the point where the player is mostly oblivious to the dropped frames; the advantages of the higher frame-rate elevate the experience beyond the average 30FPS shooter thanks to that arcade-level response from the controls. The Black Ops campaign, on PS3 in particular, strayed much closer to the 40FPS level for extended periods of play, control suffered as a consequence and suddenly COD started to feel more like a standard console shooter. Yes, the E3 code is obviously not final and we'd hope to see an optimisation push in the lead up to the product shipping, but the concern is that Black Ops 2 could break that perceptual 60FPS barrier - especially when the end segment of the demo, including the airborne section actually appeared to be running at a locked 30FPS. For what it's worth, video of the multiplayer mode shown on Spike TV (not taken from a live console in the studio, but direct-feed nonetheless) appeared to show a significantly higher frame-rate - not quite as solid as Modern Warfare 3 performance, but well within the perceptual 60FPS threshold. Arguably, maintaining that frame-rate is more crucial to the online game, where players running at a lower frame-rate - even momentarily - would be disadvantaged compared to those who aren't. But, looking at the inconclusive campaign footage, a number of questions spring to mind: has the current generation run out of horsepower to meet the ambitions of top-tier developers? And, factoring in that every COD title has seen an Xbox 360 advantage, how will the PS3 game cope in like-for-like circumstances? 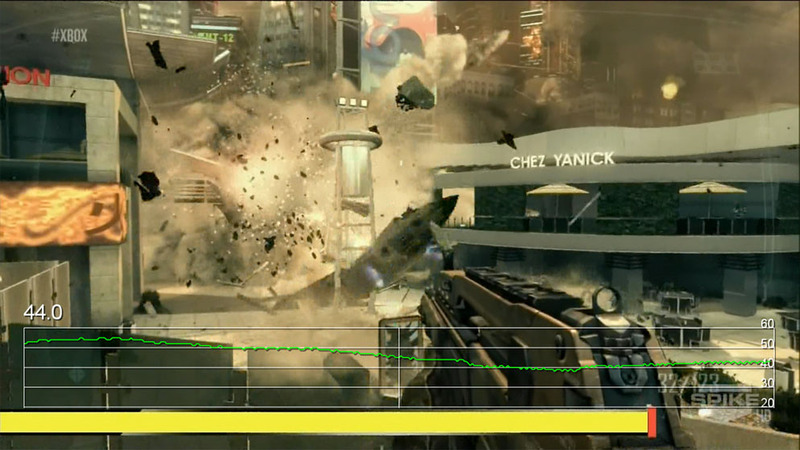 Black Ops on PS3 saw an additional resolution hit over the 360 version, and in the worst cases ran with a 20FPS penalty in similar gameplay scenarios. Until Modern Warfare 3 appeared and improved performance levels, there was a sense that the Infinity Ward engine was perhaps in need of a fundamental refresh. "Treyarch studio boss Mark Lamia suggests that with Black Ops 2, players will get the full-fat Call of Duty gameplay experience and all the extra graphical bling they crave." The E3 presentation could suggest that the tech has been pushed so much that the crucial interface between player and game is perhaps in danger of being compromised, something we won't know for sure until we're hands-on with final code. Treyarch studio boss Mark Lamia begs to differ, suggesting that in Black Ops 2 players will get the full-fat COD gameplay experience and all the extra graphical bling they crave. "I think what people are asking for is for us to push. They want us to make a better-looking game; they want things. I don't think those are things people can't ask for. We asked ourselves that very same question - we wanted to advance the graphics. I think the questions are valid," he told Activision blogger Dan Amrich. "The answer may not need to be an entirely new engine, but you might need to do an entire overhaul of your entire lighting system. The trick is, we're not willing to do that if we can't keep it running at 60 frames per second - but we did that this time. So this is the Black Ops 2 engine."